Color Blender is a unique blend of resin and solvents that can be used as a basecoat blender, as well as a variety of other applications. It can also be used as a wet-bed sealer, cut-in clear in areas not exposed to sunlight, mid-coat clear for tri-coats and lock-down clear for graphics and metallic colors. 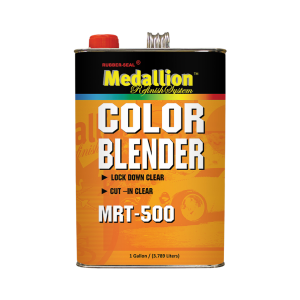 MRT-500 is compatible with most basecoat systems and can be reduced with standard and reactive type reducers. See Technical Data Sheet for instructions, applications and special notes. Available in quarts and gallons.